When AdWords first launched in 2000, manual and automated bidding were the only options. To succeed in paid search, you really had to know how to bid. You would manually set keyword bids and apply performance filters for each (manual bidding) or run scripts that defined specific criteria and adjusted bids automatically based on those criteria (automated bidding). For example, you would manually increase a bid on a keyword that you see performing well or use a script that would increase bids by Y% if your keyword position dropped by X%. As you can imagine, most optimizations take a lot of time and labor -- and not too much strategic thought. It is tedious and repetitive work. So it comes as no surprise that Google took all that data they had been collecting over the years and applied the knowledge to an algorithm that could do all that monitoring and optimizing on its own. Unlike automations, where you apply keywords bids and optimizations across all users uniformly, Google now uses this knowledge to figure out how to bid for each single search query -- the most precise, granular level you can get. In this article, we'll look at how PPC advertisers can use Google Smart Bidding to improve their campaign performance. 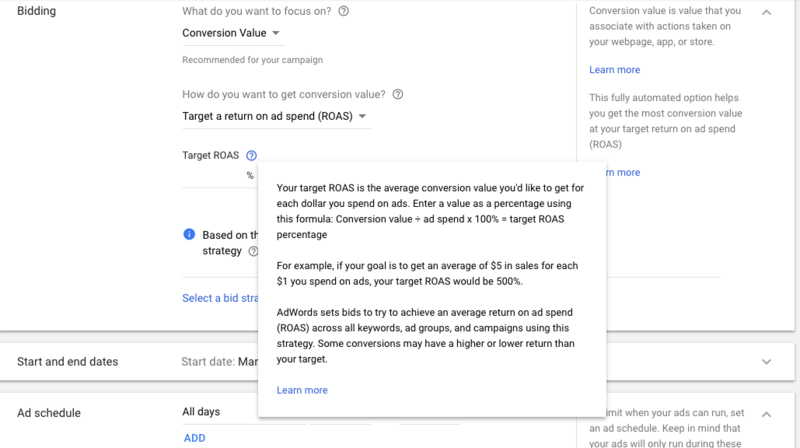 Caps your cost per acquisition while maximizing conversions. Works best for advertisers who don’t want to cap cost-per-acquisition and just spend the entire budget while getting as many conversions as possible. Combines manual bidding with Smart Bidding to raise or lower your manual bids based on whether the algo thinks the conversion is likely to happen. Note: Historically, the manual bids have been restricted by the max CPC and could only be increased a bid 30% above that number. That has changed: the bid cap was fully removed last year. 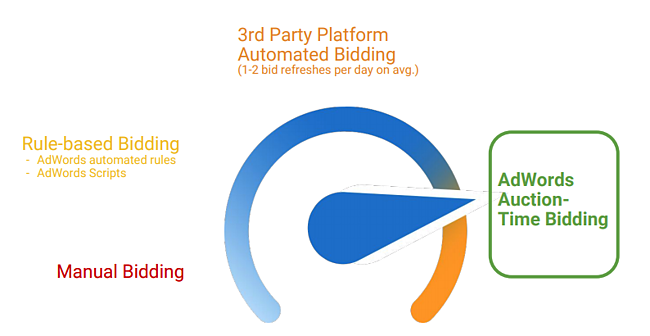 You can use Smart Bidding to complement your current PPC strategy and use a third-party PPC tool for bulk edits and reporting across networks. Imagine a shopper searching on Google for new shoes. Which ad would she click, if any? Here’re a few things we want to know first. Is she searching for shoes on a desktop computer at home or from a smartphone on the go? Where is she based? If she’s based in San Francisco Bay Area, which part? (E.g., if the store has a physical location in Oakland or San Mateo, it may be easier for Alice to return the shoes in case they don’t fit). What time is it now? Is she searching on a work day or on the weekend? Morning or night? Is she searching for leather shoes, Kate Spade shoes, or party shoes? Which language is set in default settings for her Google account? Safari, Firefox, or Chrome? Where is the query coming from? If you know all these things about her, you’ll have a better shot at capturing her attention. If you only define a couple of search signals when you set up your campaign, you’re losing money: most impressions won’t convert into clicks. Yet optimizing for each user’s unique search context simply doesn’t scale. Every year Google AdWords keeps layering new features and tweaks on top of the existing ones. Since the AdWords launch, Google has added separate bidding for its content network, quality score, tablet retargeting, sitelinks, clicks-to-call and clicks-to-message, shopping campaigns, ad customizers, customer match, extensions, Gmail ads, PLAs, RLSA, DFSA, ETAs, and more. "Yes, you might be able to squeeze out a couple extra conversions by being more in-control and constantly doing manual bidding," said Natalie Barreda, Director of Paid Search at Point It, a digital marketing agency. "But truly that’s not the best use of your time." In earlier days, bidding was central to advertising on AdWords, making the PPC advertiser slave to the ever-changing tweaks and add-ons of the algorithm. If Smart Bidding indeed evolves to automate itself to make the best bets, in a Deep-Blue-vs.-Kasparov style, that shift will open up opportunities for a whole new gameplay, in which advertising will be more about empathy (with strategic targeting) and creativity (with thoughtful copy and design). In a nutshell, if you were to bid on an ad for the online shoe-shopper Alice using manual bidding or automation vs. Smart Bidding, you’d miss out on capturing granular contextual signals, and probably spend too much time figuring out which filters to apply to your campaign. If you’re running campaigns with little historical data, you might want to check how it performs with a manual/automated test run first. Dan Gilbert of Brainlabs recommends using other automation when your marketing goals don’t align with Smart Bidding strategies, such as if you want to drive more traffic to your website with generic keywords. If you’re running a short-term campaign (such as for a flash sale) or your current campaign numbers are totally off the charts, stick with your trusty automation. Search advertising is, perhaps, the best playground for machine learning. With so many contextual signals Google offers to make ads relevant, using PPC automation and Smart Bidding makes sense for several reasons. For starters, Smart Bidding helps advertisers get a better shot at understanding user intent for each specific query. It also frees up time for things that are really, really hard to automate -- like strategy and creativity.